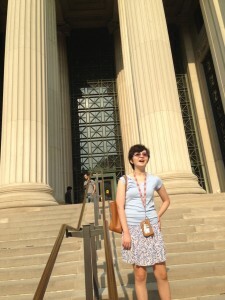 This past weekend (Labor Day), Taylor and I went to Boston to move her back to MIT. It has been just over 1 1/2 years since her cardiac arrest, and a stark contrast to the last time we were here. Last time, it was late February (winter). I remember walking back and forth through the cold, wind, and occasional snow, over Longfellow Bridge between MIT (where I stayed) and MGH (where Taylor was in the ICU). For nearly 5 weeks I did this, choosing to walk to clear my head of the sadness and dread of what we had been told was Taylor’s prognosis, instead of taking the T, even though MGH was only 1 convenient stop away. This time, it is summer and hot and humid in Boston. The town was even experiencing somewhat of a heat spell being in the 90s. Taylor and I both sweated as we walked around buying things we forgot or neglected to bring for her dorm room. This time, the bridge we walked over and back together was Harvard. Last time, we were taking her out of school with heavy hearts. This time, she is returning to school with much hope. As the other students were moving back in, too, there was a lot of excitement and energy on campus. Taylor confided, however, that she was feeling overwhelmed at times. We both knew that she was not coming back to MIT with the same capabilities as when she first started as a freshman. Even though she is only taking 2 classes to start, it will be challenging for her. She still has trouble with her activities of daily living (ADLs) – the many things you and I take for granted – like untwisting caps, handling money, writing/typing. And she still has only limited functional sight. She is coming back with assisted technologies (Orcam, Dragon Dictate, Kurzweil) and assistance from the Students with Disabilities Office to help her with her classes. Her intellect is intact, but her processing speed and multi-tasking capabilities are still troublesome. Her brain requires her to focus on one thing at a time; otherwise, she gets frustrated. We anticipate that all of these things will continue to improve, but this will take time. Despite these challenges, Taylor is determined to resume her studies at MIT. That is what is so amazing about her. She sets goals and goes for them. Here is a picture of Taylor in front of Building 7 off Mass Ave.
As such, I want to take this opportunity to thank everyone who has been involved in this journey with us - for the people who contributed money either through the GoFundMe page or to us directly, for the people who bought us plane tickets when Taylor was at Craig, for housing, for the many words and letters of support in cards/letters or commenting on this blog, for the gifts of audio books, food, dinners, blankets, prayers, for checking in on Nathan when we were away, and all of the caregivers who helped Taylor so much. Thank you; we would not be where we are today without you. This entry was posted in Updates by Kit. Bookmark the permalink. That’s so wonderful that she is back at MIT!! I am so happy for her I’m sure it will be hard, but….what isn’t?!! Nothing worth it comes without challenge and sacrifice. Good luck, Taylor and don’t give up!! Not that it seems like I need to tell you that! Taylor is an amazing woman! The power of positive thinking is miraculous. Thank you for the updates! !